Congratulations to those who have been selected as one of San Diego's Top Influentials and to those who have been recognized as Influential Industry Leaders for 2015. Thank you to all who participated in the nomination and peer-voting process this year. Every year, San Diego Source/The Daily Transcript shines the spotlight on the people who help drive and influence our county's growth and prosperity. In the past, this has been a choice left up to our staff based upon their daily reporting on the business community. This year, we added to the program a peer-nominated process, in an effort to find individuals the readers believe influenced the course of events within specific industries. To accomplish this, more than 500 email invitations were sent to leaders in 13 different segments, including real estate, construction, technology and biotechnology, finance, nonprofits and more, asking them to nominate someone — with whom they had professional experience and were worthy of recognition — as a Top Influential for 2015. These industry leaders are made up of former Top Influentials, our roundtable attendees and experts that our reporters have been talking to all year long. The nominees within each industry sector were then asked to vote among themselves. 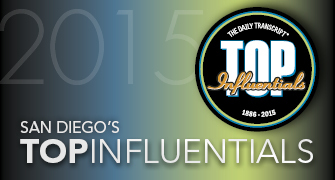 2015 Top Influentials will be recognized both in print and online. A reception will be held for the winners in February 2015. Your opinion and nominations are important to us. If you have any questions about the process, please contact topinfluentials@sddt.com. Highlight your company's expertise by advertising or sponsoring Top Influentials. Contact us at 619.232.4381 or contact@sddt.com to get more information today!